Monitor Audio Gold 50 review | What Hi-Fi? In its decade-long lineage, Monitor Audio’s Gold series has hatched three generations: the Gold GR, Gold GS and Gold GX ranges. The latest addition strips the traditional abbreviations for the simpler sobriquet ‘Gold’, and brings eight new models to the table. The Gold 50s (successor to the four-star Gold GX50s) are the smaller, least expensive standmounters. They come with a sprinkle of upgrades to the bass cone, tweeter and grille design that apply across the range. The bass driver uses an ‘evolved’ 14cm version of the company's dimpled Rigid Surface Technology (RST) cone to deliver cleaner, deeper and more accurate bass response. While the C-CAM ribbon tweeter is mechanically identical to its predecessor on the GX speakers, Monitor Audio claims that improved production tolerances result in a more open, detailed sound. Lastly, there are now magnetic ‘floating’ grilles. The changes aren’t huge then but are they significant enough to set a new gold standard? The G50s very much follow in their predecessors’ footprint with a sonic character that’s clean, detailed, open and precise. While we don’t have the GX50s to hand, from memory, the G50s sound livelier and a little clearer too. But even so, they aren’t the last word in excitement. Nina Simone’s My Baby Just Cares For Me has a natural perkiness that’s slightly stifled by the Gold 50s. Dynamics and – unsurprisingly for their size – authority trail the very best rivals too. Instead, the Monitor Audios are more about tonal balance and refinement, both of which are exemplary. Their well-organised presentation means that every element of the track slots into place. Drums are hit with accuracy, vocals are focused and well projected, and pianos are supple and crisply timed. The ribbon tweeter does a stellar job: cymbals are defined and there’s a sense of layering to them. The Gold 50s are a little picky about placement so it’s worth experimenting with the initial set-up. Mids tend to lack substance when the speakers sit out in the middle of the room. A rear wall gives Simone’s vocals more soul-stirring depth, but be cautious about shoving them right up against the wall – bass can lose some definition and agility. A good pair of stands will bring out the best from the Gold 50s. We can always rely on Monitor Audio for gorgeous aesthetics, and the Gold 50s are no exception. They don’t veer too far away from the GX range’s shapely physique, but the cabinets – heavier and sturdier than they look – have friendly curvaceous sides and tapered corners. They come in four smart finishes: dark walnut veneer, high gloss white lacquer, piano ebony and piano black lacquer. The neat fascia and quirky dimpled driver is reason enough to keep the grilles off. 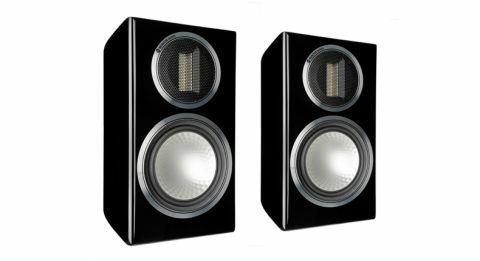 At face value, the Monitor Audio Gold 50s are an attractive option. Get to know them better and that opinion sticks. They aren’t the bubbliest performers £1000 can buy, but their precision, detail and agility are redeeming qualities. If the 50s are anything to go by, the Gold series is heading in the right direction for five-star glory. It’s just not quite there yet.